Yep, the bottom gave out on one of the 10-pound flat of blueberries we picked last week, leaving what could have been Sig’s dream come true. After the spillage, in one quick motion, Rob scooped up the blueberry-loving pup in one arm (who was more then well-aware of what just happened, and quickly thought he could possibly “help”), grabbed the kitchen camera with the other, all the while giggling like a little school girl waking up Christmas morning. Luckily, I was wearing black shorts. There were berries under the couch, under the TV stand, not to mention on us. Our hands and nails were stained a dark purple half-way through the clean-up, until Rob got the, dare I say brilliant, idea to use pancake spatulas to scoop up the massive amount of rogue fruit. It worked, although, I’m sure it was quite a sight: two grown adults on hands and knees, butts in the air, scooping up everywhere-blueberries with black spatulas, doggie outside whining at having been demoted to a spectator behind the screen door. 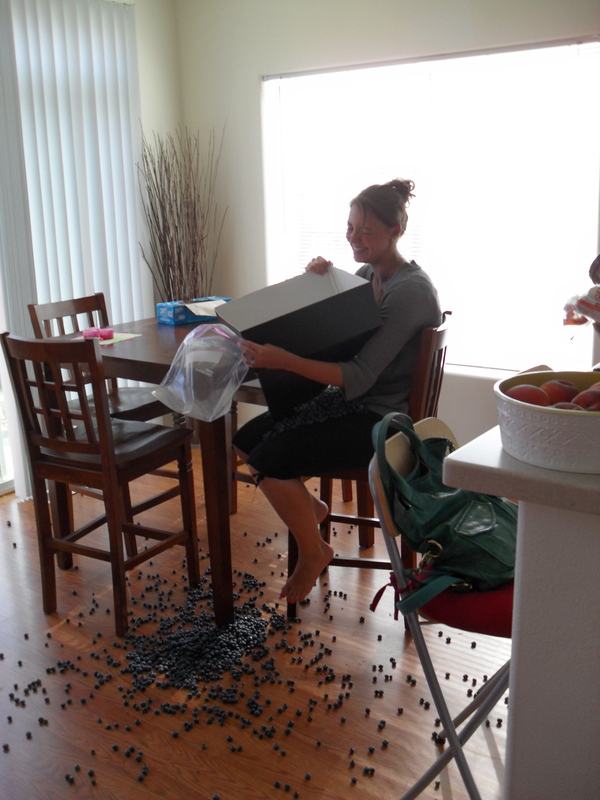 We were able to clean up the blueberries without squishing too many (although the Lucy and Ethel grape-stomping scene was vividly on repeat in my head). And those that did not survive the fall, or the feet, Sig happily partook. While I do not recommend eating many fruits off the floor, I figure if you boil something long enough, all the germs are bound to die, right? Luckily, I still had some frozen blueberries that needed a “preserved” home, so I quickly got to canning my blueberry sauce, making room in the freezer for the new batch of living-room-floor-berries. The blueberry sauce can pair with everything. Seriously. It is the seen-on-tv-type sauce when it comes to versatility. Because it is not sweet, just perfectly blueberry-y, oatmeal, ice cream, chicken, steak, and mixed into a vinaigrette have all been viable (and delicious) options. But my new favorite was this morning’s meal: Rosemary Chia Banana Bread paired with the Blueberry Sauce. Simple, summery, light, healthy, and delicious. Chia seeds are similar to flax seeds, and are a huge staple in the supplemental health department. 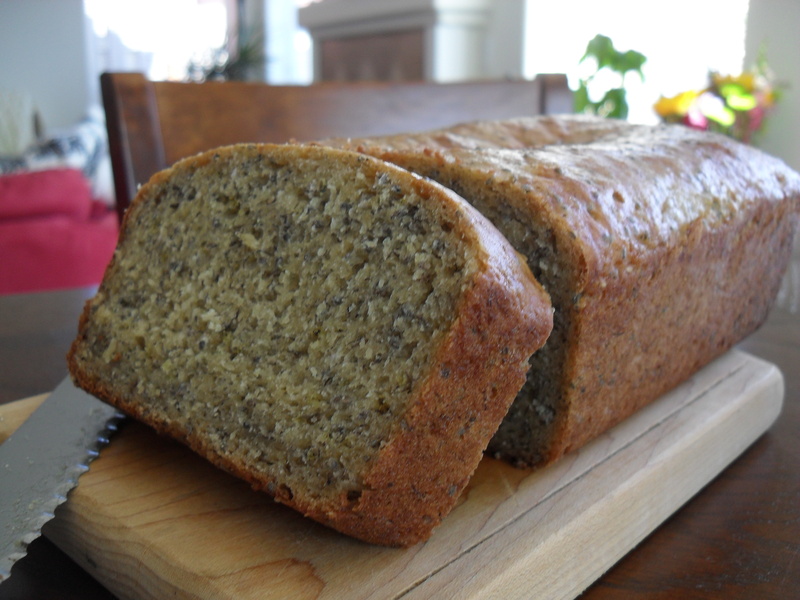 The Rosemary combined with the banana gives the bread a very earthy taste. It’s probably my new favorite breakfast bread. Adding the rich, tangy, blueberry sauce make this morning a far cry from yesterday’s debacle (much to Sig’s dismay). Nothing yet has spilled today, but, it’s still early – haven’t even begun preparing dinner! Lightly butter and flour a loaf pan, and set aside. Mix all the dry ingredients (including the rosemary), minus the sugar, in a large bowl, and set aside. In a stand (or hand) mixer, cream the yogurt, vanilla extract, and sugar together until creamy. In three separate batches, mix the dry ingredients into the wet, mixing until dry ingredients are just incorporated each time. Add the thawed bananas and all the liquid from thawing the frozen overripe fruit. This will add a ton of flavor, as well as create moist bread. Once the bananas are incorporated, pour the batter into the prepared loaf pan, and bake in the middle of the oven for 40-45 minutes, or until the bread is golden and a toothpick inserted comes out clean. Cool, and enjoy with blueberry sauce! Pour all ingredients into a large pot, and heat over med-high heat, stirring occasionally, until the mixture begins to bubble and starts to foam. Spoon off the foamy top layer, and lower the heat to a simmer, stirring occasionally for about 30 minutes. You will know the sauce is done when the bubbles become gloppy, and the mixture coats a spoon. There will still be chunks of blueberries in the mixture, which gives the sauce a nice texture. 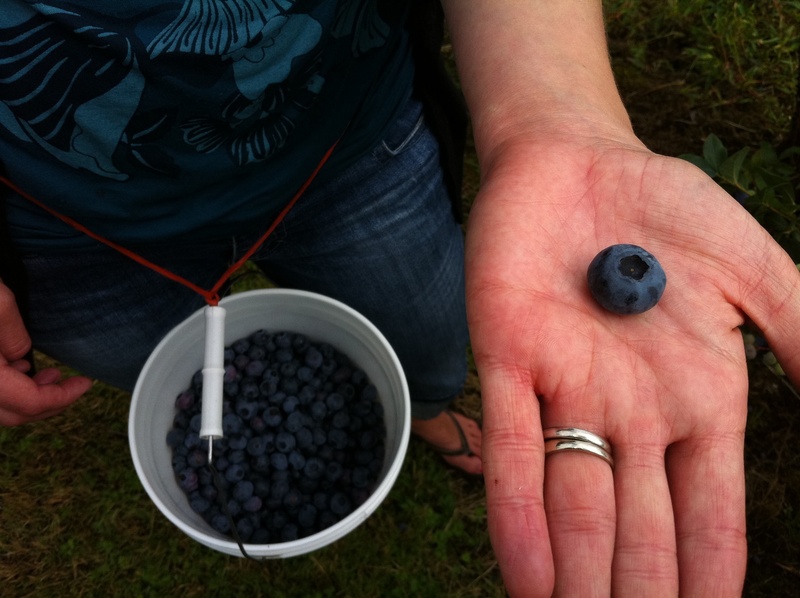 It should taste like true blueberries – not jammy, or overly sweet. Just blue. 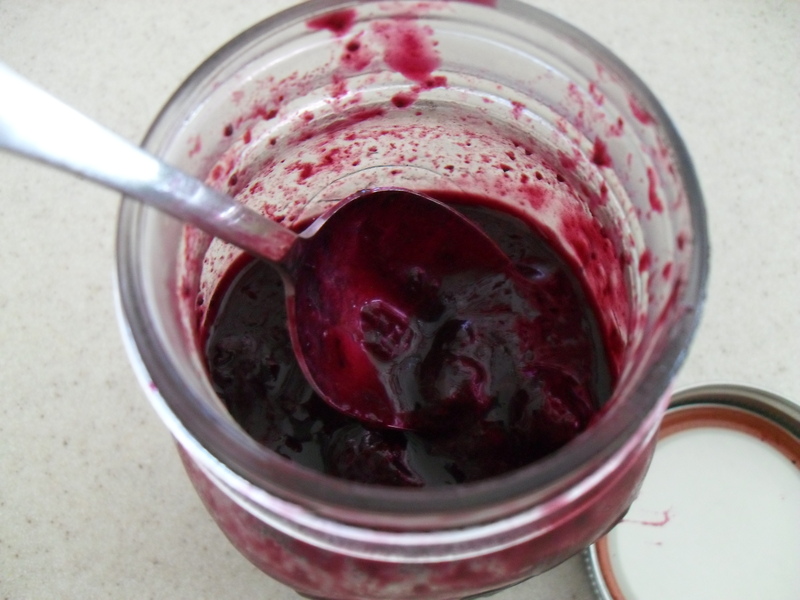 Follow an approved canning/preserving method, or keep in a sealed container in the fridge for a few weeks. Not really – things are great! We’ve had beautiful sunny days on the Oregon Coast, Empire Café’s booth at the Farmer’s Market is selling out, and aside from Sig’s new obsession of sneakily stealing and chewing on wine corks, life is good. But I do still have blueberries. Lots of them. During our spontaneous Costco visit the other day (spontaneous because Costco is two hours away, and we hadn’t planned on going), we picked up some beautiful flank steak. Our Coos Bay butcher, while having some great, local, and sometimes hard to find cuts of meat, he is often lacking on the flank steak. It’s a wonderful cut of meat – thin, flavorful while still on the lean side, and responds beautifully to marinades. I don’t see much of it in restaurants, and I’m wondering if my naïveté is missing something in the steak world; like my affection for flank steak is similar to saying fake nacho cheese is good for you (isn’t it?). Anywho, growing up, my mom used to make flank steak all the time. She’d grill them on the rare side, a little more rare than my dad would prefer, and slice them construction paper-thin. 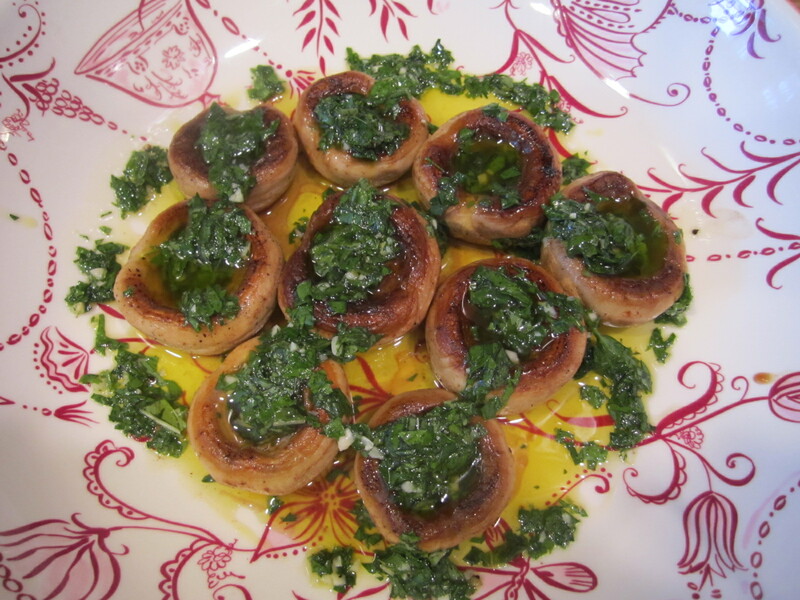 She usually served them with one of our favorite sides – sautéed mushrooms in butter and wine. Those were usually gone within the first serving. In my way younger days, I coined the term, “Red Juicy Meat,” in our house and would ask for said food almost every dinner. And the leftovers were perfect for sandwiches – PB&Js were great (still are), but nothing beat a 3rd grader’s steak sandwich. What? You didn’t get all that? So, our summer steak dinner came together beautifully and blue. 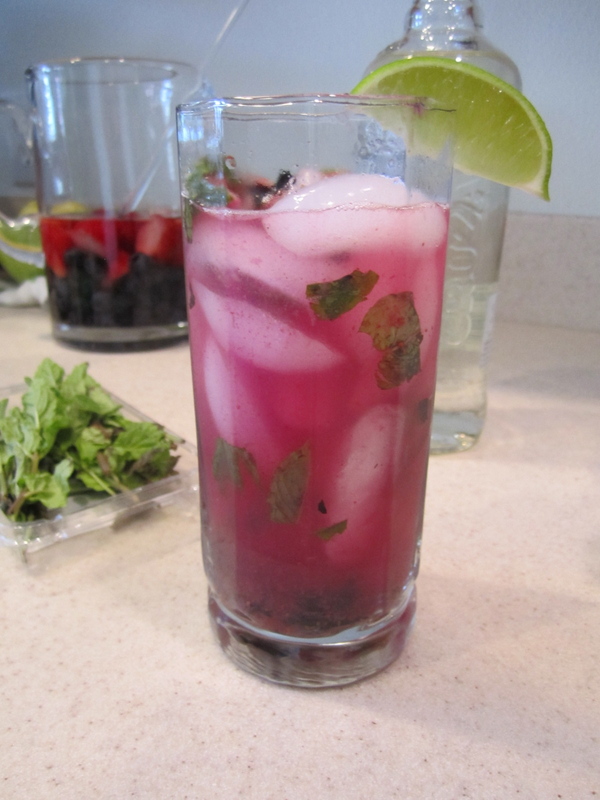 Rob had the inspiration to make Blueberry Mojitos (if you want the recipe let me know – I’ll have to ask him how they are made! 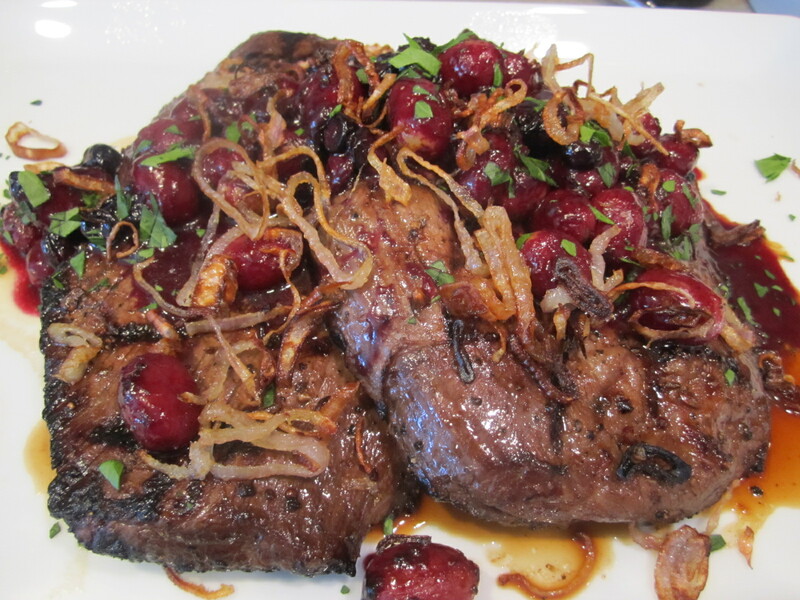 ), and they were the perfect start to our Flank Steak with Roasted Blueberries and Grapes. And the mixture of the juices from the wine, garlic and herb sautéed mushrooms (I adapted and changed the Canal House Sautéed Mushrooms a bit) was a tangy fresh paring to the hearty meat. The Roasted Blueberries and Grapes weren’t too sweet, masking the integrity of the steak, but rather gave a syrupy contrast to the salty marinade. It was divine. 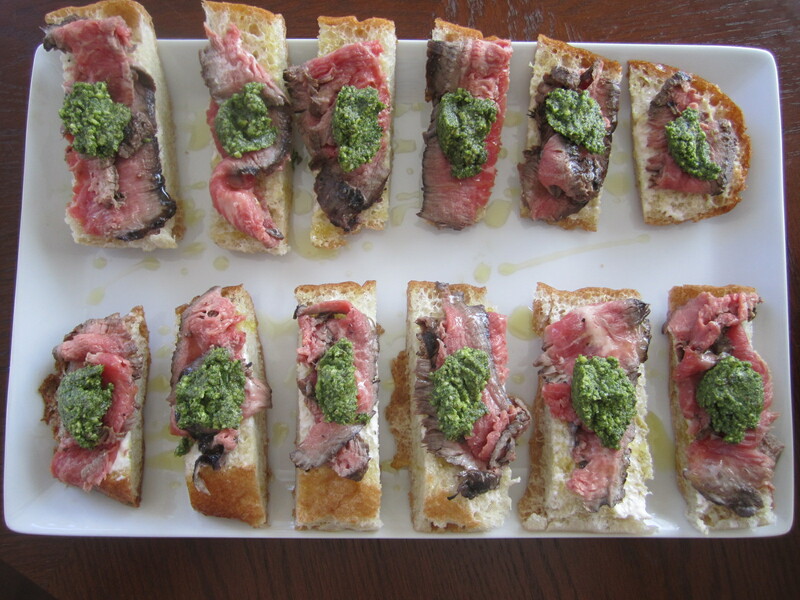 In true tradition, the mushrooms were gone within the dinner, but the leftover steak made for a great appetizer the next day – mini steak crostinis. It was no lunchtime steak sandwich, but still great. As I write, I’m finishing the last of the fresh blueberries, popping them in my mouth like bar mix at a pub. But don’t worry; there are 5 more gallons in the freezer. crispy shallots (optional, for garnish) – simply heat up about 2 c canola oil in a small pot, and drop in thinly sliced shallots in about three batches. Take out of oil when golden and crispy, and place on paper towel to drain. Sprinkle with a bit of fine sea salt while they are still warm. Preheat oven to 500 degrees, and preheat grill. To make the marinade, combine the soy sauce, thyme, pom juice, garlic, and cracked pepper in a large lasagna pan. Add the meat, turning a couple times to make sure it is covered. Marinade for at least 1 hour (2 hours is the max outside of the fridge), up to 8 in the fridge. Meanwhile, in a small cast iron pan, melt the butter (I just put the pan with the butter in the oven while it’s heating). Once melted, but not browned, add the grapes and the blueberries, and a bit of s&p. Mix together, making sure the fruit is coated with the butter. 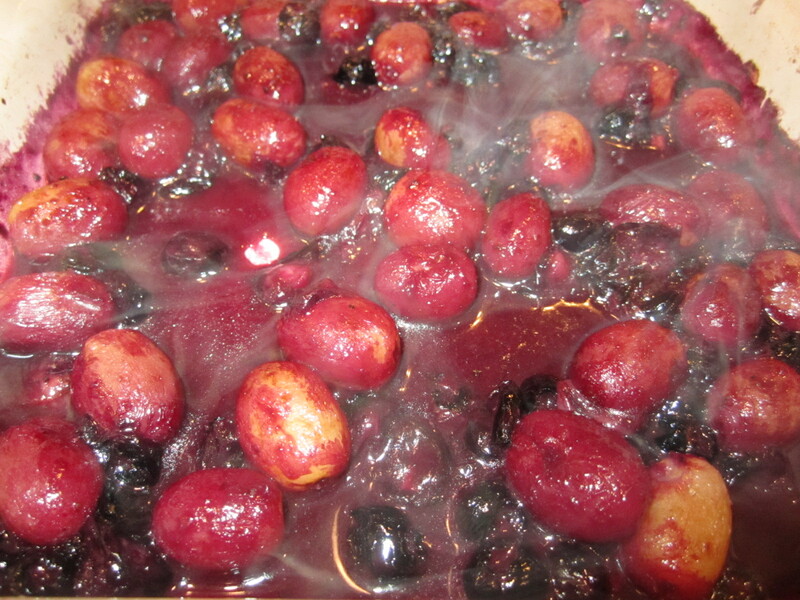 Roast in the oven for 20 minutes, or until the fruit is syrupy – blueberries have released their juices, but still have some integrity, and the grapes are swollen and look as if they are going to pop. Take out of the oven, and immediately hit the fruit with the balsamic vinegar, mixing to combine. Take the meat out of the marinade, and pat dry. Drizzle steaks with olive oil, salt, and a generous amount of pepper. Grill to your liking (I think medium rare is the best for flank steak). After grilling, let meat rest for about 15 minutes tented with foil. When ready to serve, place on a platter, slice thin strips against the grain of the meat, and pour the lovely roasted fruit on top. Sprinkle some parsley and crispy shallots on top, and you’ve got a winner winner steak dinner. Mondays are not usually the most desired day of the week. It means waking up early, going back to work, and generally looking “forward” to the rest of the week ahead. Right now, every Monday I tend to look forward to getting involved in the crazy unrealistic antics of the Bachelorette on Monday nights, but aside from that, it’s pretty much a dull day. That is, unless you are a teacher (summer’s off), or a Coast Guard pilot (have random days off). Rob and I had a huge Honey-Do list of tasks for Monday, all of which necessary, but nothing to write home about. You know the things I’m talking about – the “Dos” that pile up – cleaning out the garage, go through the wardrobe, donate to Goodwill, etc. But when Rob got home from work Monday morning (he had overnight duty the night before), we were in no mood for cleaning. Last week, my mom was visiting us, and we had the best time. 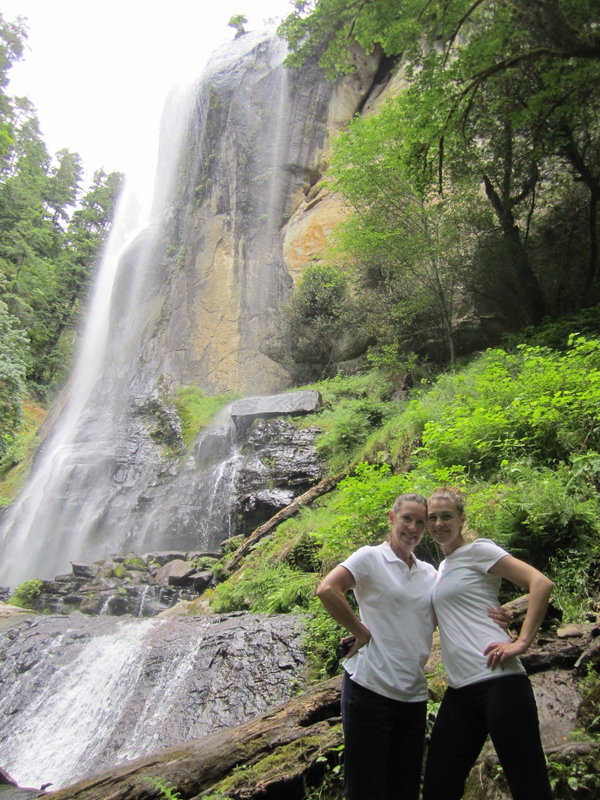 We hiked, we ate, we shopped, we ate, we cooked, and yes, we ate some more. There were memorable experiences with snakes, a questionable experience with Sasquatch, a terrifying chipmunk, and a Coast Guard C-130 to start off our time together with a bang. Despite enduring the wonderful Pacific Northwest travel discrepancies, hopefully, my mom left here with a satiated, warm, and comfortable feeling that I hope all my guests feel when then they depart. I know I had that feeling, and still do… I miss her. Needless to say, after exploring Cape Cod, and then playing around Oregon with my mom, the last thing Rob and I wanted to do was pick up a sponge. 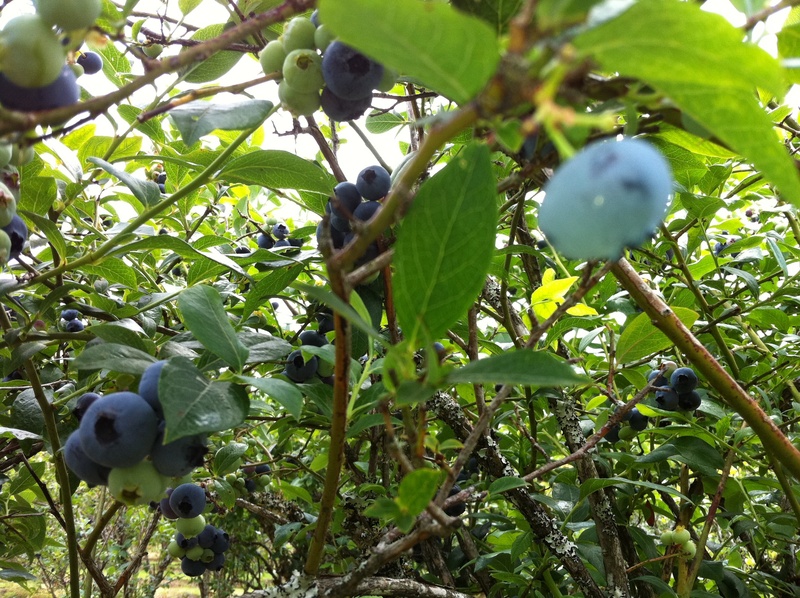 The SUN was out (it was a “Yay Oregon!” day), and we had planned to go blueberry picking at some point this summer. So, agreeing that we would come home and be responsible adults right after picking blueberries, we put on our hats and sunscreen and drove inland to the warm, beautiful farming valley. When it comes to blueberries, Rob and I differ in our gleaning ways, so to speak. He is diligent, gentle, simply nudging blueberries with his knuckle and letting the ripe ones fall off into his bucket. They make the softest little plop, plop, plop, a sound that is both exciting and humble simultaneously. He finds the biggest berries (like a true man would), and bypasses the ones that aren’t on the verge of bursting. He has a keen eye and being tall, gets the berries on the top of the bush, the ones gathering the most sun until their little juices are almost starting to bubble – those are the sweetest ones. I, on the other hand, have my own way of gathering the blue loot. Drawn to the clumps of berries hanging beneath the leaves and thin branches for dear life (similar to wine grapes hanging off the vine, which is probably why I’m drawn to them), I softly lift up the branch, find the hidden berries, take the bunch with one hand and carefully massage the berries. The berries that are ripe easily fall out of the clump into my other open hand waiting to catch. While lacking the delicacy that Rob displays leaves me with a few discarded berries, I find the dark hidden gems, and the efficiency leaves me with a full bucket. We didn’t chat much during our picking. We just stood side by side, tasting a berry off each new bush (each bush produces slightly different tasting berries), and every once in a while looked up and exchanged a simple smile. We were in our own little blueberry world, feeling close to nature (such a clichéd, hippie phrase, but it does explain the feeling), and close to each other. Blueberry picking was one of the first things Rob took me to experience when I first moved to Oregon, which made the experience that much more meaningful. 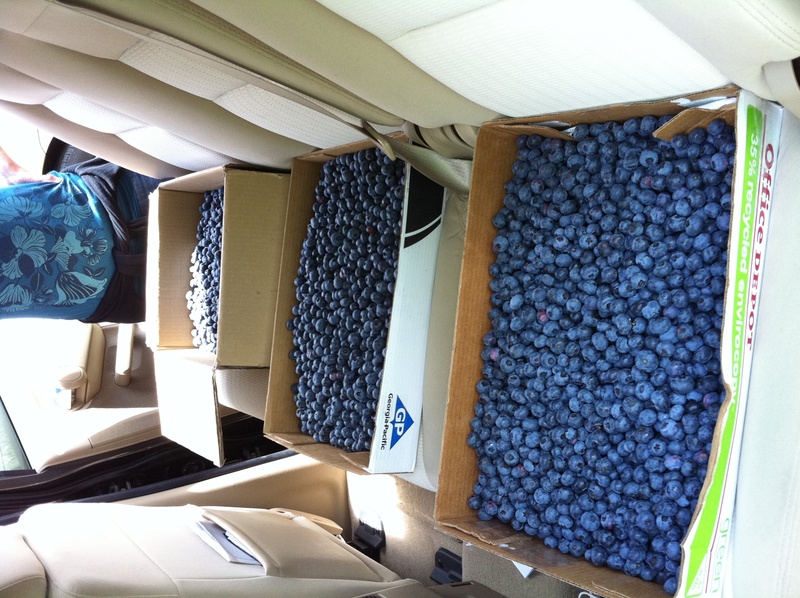 Twenty-three pounds of blueberries later, we piled back into the car, sweating, wiping off the occasional little spider or silverfish, and smiling from ear to ear. But then, it was back home to be the responsible adults we said we would be. Or so we thought. By the end of the afternoon, we had walked through one of the most beautiful (and oldest) wineries in Oregon, joined their wine club (after all, who knows where the Coast Guard will send us in two years – we must enjoy as much as we can while we are still living here! ), and ate the best house-made gardenburgers I’ve ever had in my life. Stay tuned: I’m going to be experimenting to get this one down perfectly. The butter on the bread (or the icing on the cake, whatever your taste may be) that ended our spontaneous outing was the nearly empty Costco we visited to pick up some household necessities, like paper towels and yogurt. And a cookbook. And gourmet mushrooms. And a 5-pound bag of trail mix. Se le vie. We were home just in time to feed the cranky puppy (how dare we have fun without him! ), and, you guessed it, watch the Bachelorette. While Rob and I were picking the juicy berries and tasting the intricate wines, both our minds were flooding with ideas and recipes to make the most fabulous use out of our blueberries. 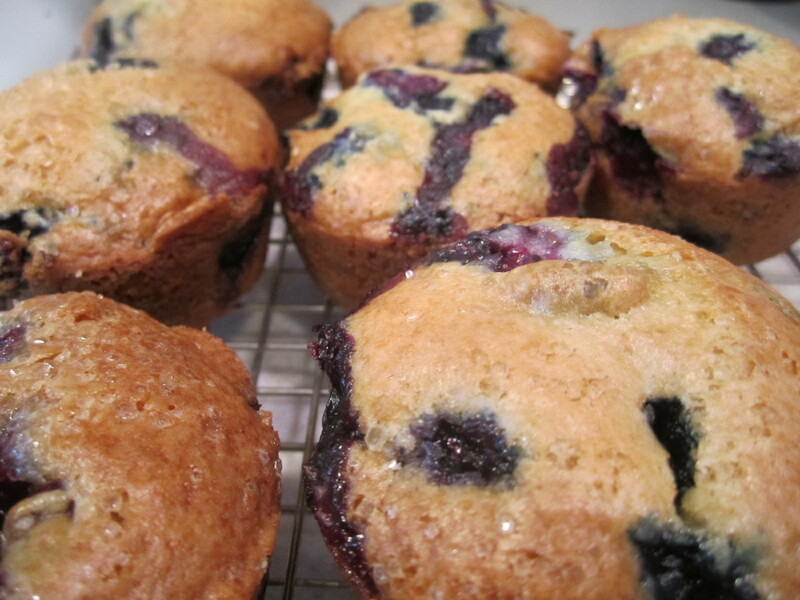 But, with Rob having to go back to the reality called a job, I figured I’d send him off with a comfortable classic, as well as one of his favorites: Blueberry Muffins. With extra blueberries. We ate one together this morning, still way too hot from the oven, and he took two more for the road. Sig is watching me type… I think I’ll make him jealous and have two more now, as well. Preheat oven to 375 degrees, and grease and lightly flour a standard muffin tin. In a stand mixer (or using a hand mixer), cream together the yogurt and sugar. Once sugar starts to dissolve, add the vanilla extract, and mix until incorporated. In a separate bowl, mix the dry ingredients together, reserving the blueberries and lemon zest. In thirds, add the dry ingredients to the wet, mixing until just incorporated. Add in the lemon zest, and mix until (once again) just incorporated. 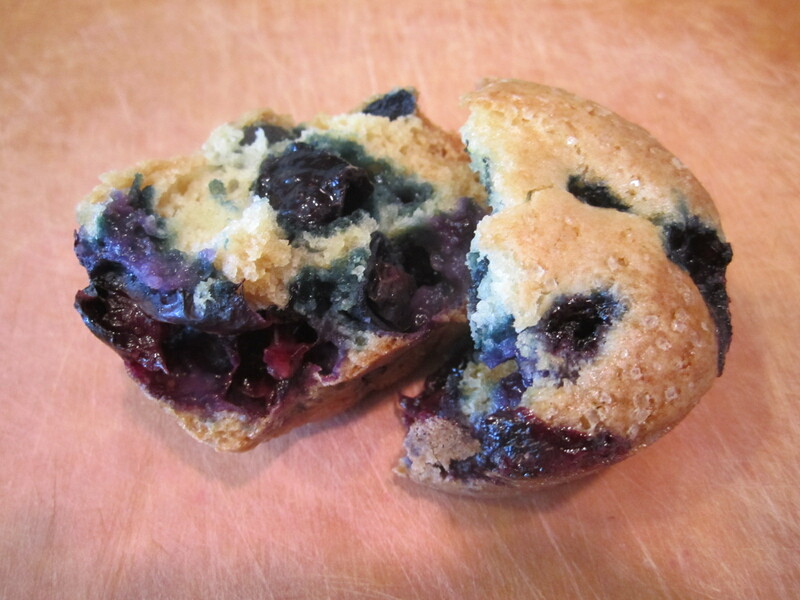 Gently fold in the blueberries with a spatula, being careful not to break the berries. Evenly scoop the batter into the muffin tin, and top the batter with a sprinkle of raw sugar. Bake until golden, and a toothpick comes out clean. Let cool (or not) and Enjoy!